Preheat oven to 450° F. Trim woody ends off of asparagus and discard. Cut the tops into bite-sized pieces. Add the asparagus to a baking sheet with 2 teaspoons of olive oil and pinches of salt and pepper, making sure the pieces are coated evenly in the oil. Roast for 5 – 6 minutes. Spread the crust with the pesto, leaving a 1/2" border around the edge. Remove the asparagus from the baking sheet and add the crust back to the same pan. 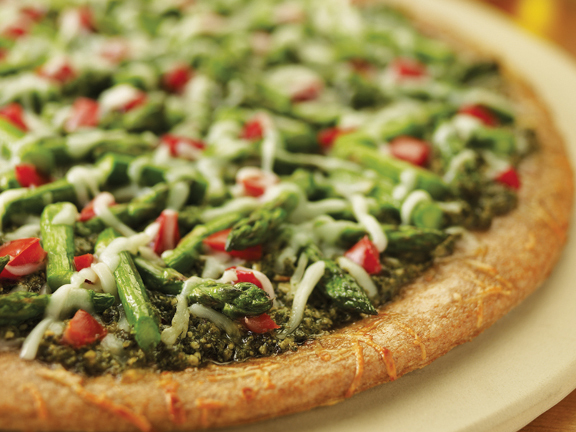 Layer the crust with the asparagus, tomatoes and cheese. Bake for 10 – 12 minutes or until bubbly and light brown on the edges.